This is a question that comes up all the time: what’s the easiest way to convert a MIDI file in to an audio file, like an MP3, under Linux? The old answer was TiMidity++ (usually just called “timidity”), a software MIDI synth that’s nearly as old as Linux itself, but it’s awkward to use and isn’t actively maintained. Today, though, I discovered that FluidSynth can do the job, and very easily at that. 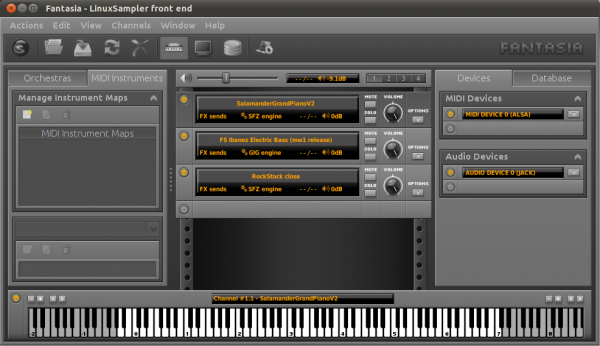 FluidSynth is a synth that plays SoundFonts; in the studio it’s usually used through the Qsynth GUI, or as a DSSI plugin in a sequencer like Qtractor, but you can also use it stand-alone, through the “fluidsynth” command-line tool. 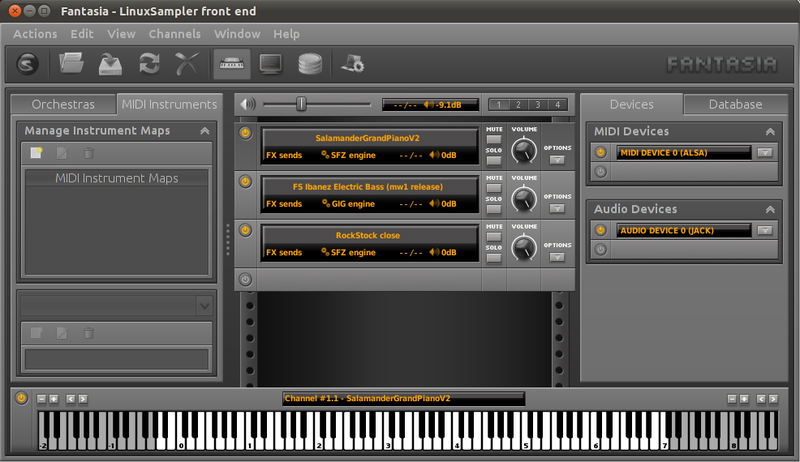 To use it, you’ll need at least one SoundFont, and there’s a good General MIDI SoundFont called “Fluid” (which, despite the similar name, is unrelated to FluidSynth) that’s packaged in most distros. The great thing about using FluidSynth, apart from its simplicity, is that you can easily substitute whatever SoundFont you want. For instance, if you find Fluid too big to work with, you can user a smaller alternative, like the GeneralUser GS SoundFont, or if the piece is a solo work, you could use a higher-quality solo instrument SoundFont, like jRhodes3, which is a great Rhodes sound. It’s a little longer than I’d have liked, but there’s a lot in there! If you’d prefer smaller, shorter tutorials in future, feel free to leave a comment and let me know. For downloaders, there’s also a 720p WebM version available (107MB). I promised I’d make an introductory tutorial to seq24, and now, I’ve delivered! If you’ve tried seq24 in the past and been confused by it, hopefully this will clear up some of the mysteries; if you’ve never tried it, this might just encourage you to give it a go! There’s an unspoken “step zero” here — get yourself a working copy of seq24. I’m not sure about other distributions, but on Ubuntu, especially 64-bit, the packaged version seems very unstable. The best thing to do is to grab the 0.9.1 version from the seq24 Launchpad and install that — this new release includes a bunch of bug-fixes, and a few new features, too. The original plan was for a straight screencast, like my earlier synth tutorials, but I was so impressed by Kdenlive that I decided to have a bit of fun with it — hopefully the fun I had comes through in the finished product. For downloaders, there’s also a 720p WebM version available. Despite a whole bunch of idiosyncrasies, I love seq24, and even though I tend to think of Qtractor as my MIDI sequencer of choice under Linux, it’s actually seq24 that I’ve used the most in producing my tracks. I’m planning on making some video tutorials for it, since it’s such a strange beast to deal with at first, but before doing that, I want to demonstrate the kind of things you can do with it. Here, then, is a “performance” of my track tiny droplets — the various MIDI loops used are all pre-sequenced, but I’m triggering them all in realtime using my QWERTY keyboard. In this case, seq24 is driving Hydrogen and my Blofeld, and I’m using Ardour as a live mixer to process and mix the audio from those synths in to a stereo stream. UPDATE: If you’d prefer to download the video rather than streaming it on YouTube, I’ve uploaded a WebM version of it. WebM is still quite new, but current versions of VLC and MPlayer support it. On a brief side note, I have to give a shout-out to my good friend AutoStatic for describing his new video capture process using Xephyr and FFmpeg — I used it here, and the results look great. The audio was captured with JACK TimeMachine, and in another first for me, I edited it all together using the brilliant Kdenlive. I’ve been slack in updating ye olde blog, but I have an excuse — I got a new phone! It’s a HTC Desire, running Android of course, and I’ve been having great fun trying different apps and discovering what I can do with it. I started a lengthy post covering my thoughts on both the Desire and Android, but in lieu of finishing that, I present you instead with an introduction to FingerPlay MIDI, a very cool MIDI controller app for Android. NOTE: The link below was to an older version of the Salamander, so the link now goes to a download page that lists the latest version. Also, LinuxSampler isn’t as temperamental as it once was when it comes to loading SFZ files, so you don’t have to follow the instructions below to the letter any more — just add a sampler channel, set it to SFZ mode, and load the SFZ file, and you should be good to go. After a bit of a wait, what’s perhaps the ultimate free piano sample library, the Salamander Grand Piano is available! One of the guys on the linux-audio-user spent I’d-hate-to-think-how-long recording every note on a Yamaha C5 grand at 16 different volume levels with a pair of stereo mics, and the result — all 1.9GB of it — sounds lovely. In part 5 of my Linux soft synth tutorial, I look at the concept of modulation — changing synth parameters over time. We saw an example of this in part 4, where we used an envelope to control the volume of a sound over time; modulation extends this to other parameters, such as the pitch of the oscillators and the filter cutoff. Modulation can use envelopes to change parameters over the length of the sound — in fact, there’s a second envelope in Xsynth-DSSI just for modulation — or the low frequency oscillator, or LFO, to perform repeating rhythmic changes. Modulation can produce effects ranging from subtle vibrato through to sweeping soundscapes and alien sound effects. Either way, it’s a powerful way to breathe life and movement in to what might otherwise be a dull sound. High-res Ogg Theora version is here, or watch the Youtube version after the jump!